Square Top Mountain is a massive peak that dominates the terrain west of Guanella Pass. 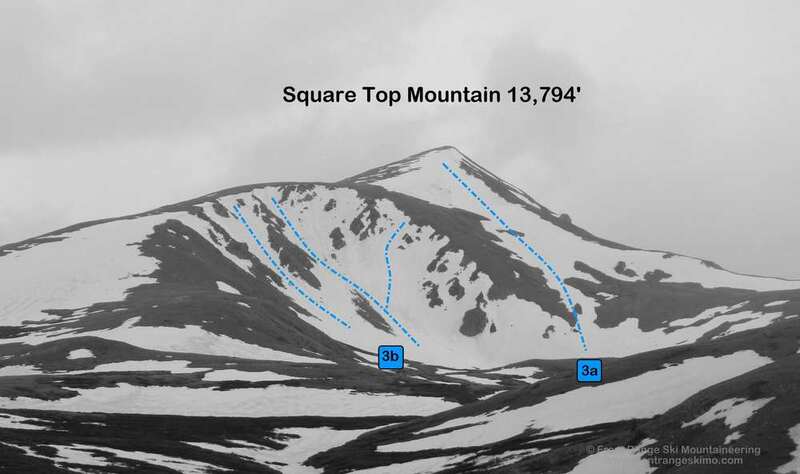 Square Top is the start of a long line of high 13,000’ peaks that gradually rise to Mount Edwards and then to the 14,000’ Grays Peak. 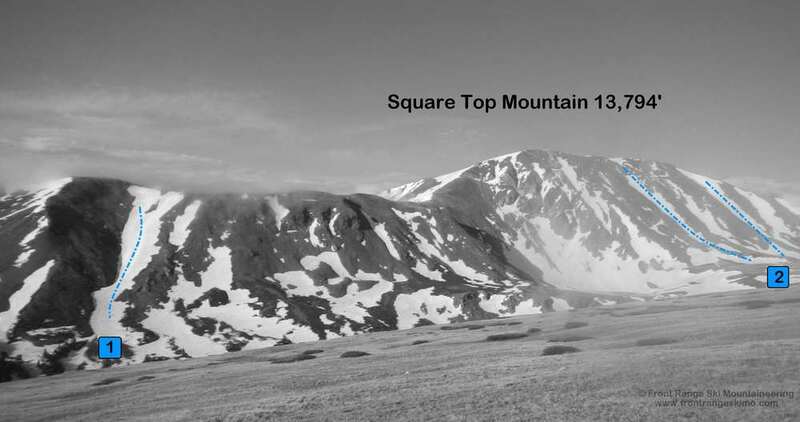 Square Top Mountain is a destination unto itself, with routes on the north, east, and south sides. The massive south side of the mountain drops over 3,500’ into Smelter Basin and Geneva Creek. The east and north sides are accessible from the Guanella Pass Road and they hold outstanding views of Mount Evans and Mount Bierstadt, both over 14,000’. Hike or ski just over a half mile on the Silver Dollar Road to the Silver Dollar Trailhead. The Naylor Lake Road continues to the right and leads to a private fishing retreat. The land surrounding Naylor Lake is private. Please respect this private land and use the Silver Dollar Trail to traverse the valley. The Silver Dollar trail wanders through the forest and is hard to follow if snow covered. If you reach Naylor Lake, contour around the south side of the lake and several hundred vertical feet above the lake. The trail is often covered in snow by the chutes on the north side of the East Ridge of Square Top, including the Naylor Lake Chute. Continue to Silver Dollar Lake to access the North Couloirs, a total of about 1.6 miles from the Silver Dollar Trailhead and 2.2 miles from Guanella Pass Road. The Naylor Lake Chute is directly above the center of Naylor Lake. It is a short and high quality run. The snow the wind peels off of the north face is deposited here and in neighboring chutes. The chute is directly above the center of Naylor Lake’s south shore. Climb directly up the chute to gain the top of the chute. The top is located on the large and blunted East Ridge that extends from Square Top Mountain. A fun outing is to climb the Naylor Lake Chute, continue to the summit, and return via the chute. The North Couloirs of Square Top are classic lines and popular ski descents. There is one chute in the center of the north face and another on the west edge of the north face near the connecting ridge to Argentine Peak. These couloirs are shallow and frequently filled with great corn snow. The harsh winds of winter aggressively carve this terrain, resulting in the snow chutes being obvious in the spring and summer. The central couloir is nearly a half mile long. There are numerous lines on this face. 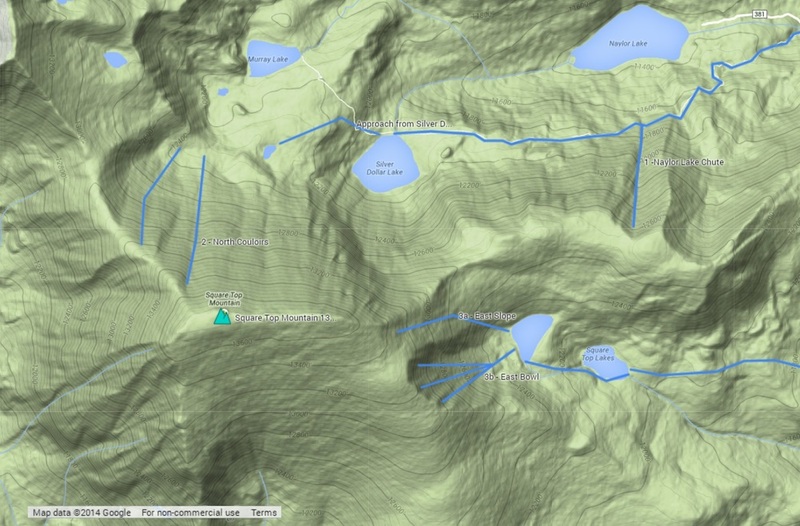 Follow the shared approach described above to Silver Dollar Lake. From Silver Dollar Lake, hike or ski a half mile west and above Silver Dollar Lake to a flat basin below the North Face. The East Slope and East Bowl are easily seen from Guanella Pass Road east of Duck Lake. They are accessed from the South Park Trail at Guanella Pass, and are fine ski runs. These routes retain consistent snow lines longer than the North Couloirs. The East Bowl has several steep lines (3b, D14), and the East Slope is a moderate path to the summit block (3a, D6). At the southwest corner of the Summit Overlook parking lot there is a distinct sign for the South Park Trail and Square Top Interpretive Trail. Follow this trail, or the approximate line of the trail, 1.8 miles to the lower Square Top Lake. Navigate between the lakes and aim to get to the Upper Square Top Lake. From here you can climb directly up the steeper runs of the East Bowl, or trend right to the East Slope and the summit. The Summit Overlook at Guanella Pass is located at the top of the pass on the west side of the road. There is also parking on the east side of the pass. The Summit Overlook is the start of the South Park Trail used to access Square Top Mountain’s East Face and Bowl. Guanella Pass is 10.8 miles from Georgetown and 13 miles from Grant on Guanella Pass Road. The Silver Dollar Road is on the Guanella Pass Road just south of the Guanella Pass Campground and at the first major switchback near the pass when driving south from Georgetown. There is a large parking lot on the east side of the road, and a smaller parking lot on the west side of the road next to Silver Dollar Road and interpretive signs. This is the lower trailhead. If the Silver Dollar Road is clear of snow and you have a high clearance 4-wheel drive rig you can drive 0.6 miles up the road to the upper Silver Dollar Lake Trailhead at 11,250’.